Please provide progress pictures and description of your "Works in Progress" so that we may share the progress with you. This British Phantom I carries a Windovers coach. 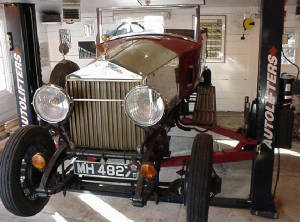 It is one of three allweather bodies built for the Phantom I chassis. This car is the only known survivor. The car was sold new to a gentleman in Chicago. It was saved from the scrap metal drives in the 1940`s only to experience a similar fate sitting in an open field near Chamois, Missouri, for approximately twenty years. 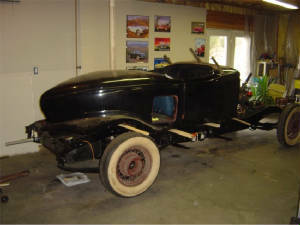 When the car was acquired the engine was seized from surface rust in the cylinders and almost all of the wood in the coach was rotted out. The good thing was the car had only 4,000 miles on it so most internal parts were like new. 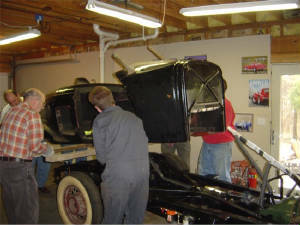 Remaining work includes finishing the fenders, installing windows, building the top and installing upholstery. Hopefully, in the near future the old gal will be back on the road again in all of her glory. Here is the frame (before and after). 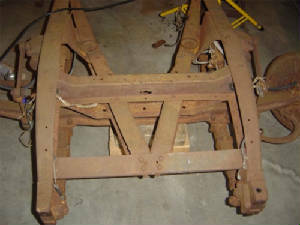 The frame with engine is from just 2 weeks ago (Feb 06)! done this all in my basement garage at my house. The Quick's had a Body raising March 3, 2007. 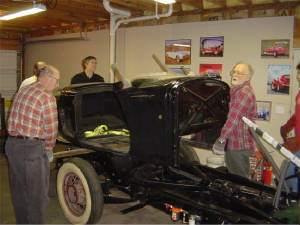 Helping with the effort were Spirit Members Richard Quick, Bob Schuman & Gene Bossaller. 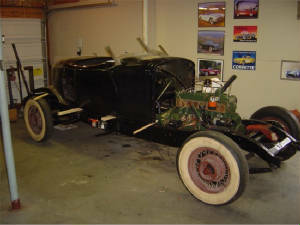 The Speedster Body is now on the Chassis. 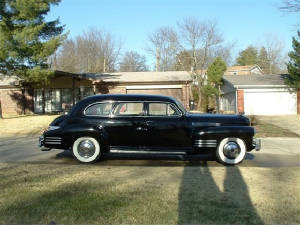 Last fall, I bought this 1941 Cadillac from a local member of the Cadillac -LaSalle Club. He had owned about 15 years and the last few years it had been sitting unused and was starting to deteriorate. It is a 7 passenger model 6723,recognized CCCA classic. It was 1 step below the Cadillac Fleetwood series 75 limousine, and its 139" wheel base is 3" longer than the 75. 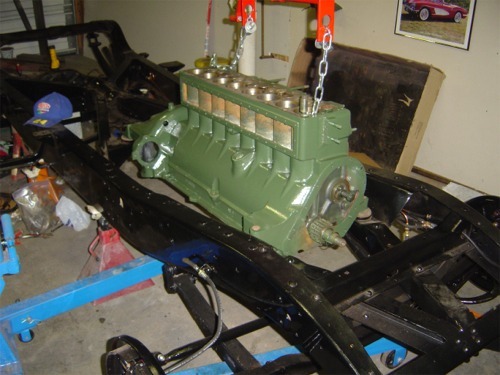 This 67 series was made in 1941 and 1942 only and it used the same Fisher Body as the 1941 Buick series 90 7 passenger sedan.This car shows about 64,000 miles and the prior owner believes that to be correct. The exterior car and engine and drive train are original, the interior has been redone nicely, however not in an original color. Someone described it as "bordello red". 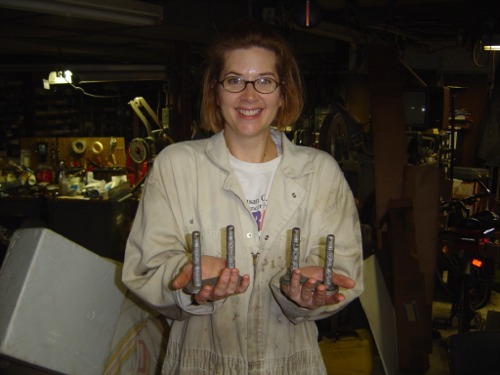 The work that I have done or had done, since owning it includes a completely new brake job, an exhaust system, clutch linkage repair, replacing all radiator hose, new vacuum hoses, repair of underdash wiring and numerous small repairs. The tires which were about 30 years old have been replaced. The engine runs very well and transmission and rear end seem to be in good condition. It drives very nicely and I hope to use it for future caravans and club activities.. It needs a lot of exterior touching up or maybe a repaint and as for the interior, I'm not sure what I can do with it, its a good twenty footer when its all cleaned up. The car was to good to let it rot. Even Kristy helps out on the project!